A recent car accident in Allston, at the intersection of Commonwealth and Harvard avenues, landed the driver of a sedan some serious citations from local officers. Accident reports indicate that the driver of the sedan failed to yield to a turning motorcycle at the intersection — he slammed into the rider and left him with life-threatening injuries, according to the Boston Globe. After the collision, the motorcyclist was transported to Brigham and Women’s Hospital, according to a Boston Police spokeswoman. The driver of the sedan was transported to St. Elizabeth’s Medical Center. Boston Police’s motor vehicle accident reconstruction experts are currently investigating the accident. Our Massachusetts motorcycle accident lawyers often discuss the risks that motorcyclists face on our roadways. What we feel needs to be discussed now is the dangers that motorists of all kinds face at intersections. We pass though plenty of intersections every day and neglect to recognize the dangers associated with these areas. As a matter of fact, close to half of the more than 5,810,000 traffic accidents that happened in 2008 were intersection-related accidents, according to the Fatality Analysis Reporting System (FARS) and the National Automotive Sampling System-General Estimates System (NASS-GES). This means that there were nearly 2,200,000 intersection-related crashes during that year. There’s really nothing to blame these kinds of accident on aside from poor driving behaviors. As a matter of fact, less than 5 percent of these accidents were attributed to vehicle- or environment-attributed causes. -Driving too fast for conditions/aggressive driving. -False assumption of other’s actions. -Misjudgments of gap or other’s speed. There are a few things that drivers can do to help reduce their risks of an intersection-related accident. These tips are simple, easy to use and should be a part of all drivers’ everyday driving habits. First, drivers are asked to stay in their lane. Be sure you’re in the correct lane you need to be in before you hit the intersection. Keep an eye on the signs at an intersection. Be on the lookout for signs indicating road work, crossing pedestrians or other restrictions. Also, you should keep an eye out for vehicles changing lanes abruptly or stopping quickly. Sideswipe accidents and rear-end accidents are all too common accidents near intersections. You’re urged to give other vehicles adequate room and to never tailgate. You need all of the reaction time you can get in these areas. Look in all directions before making turns. Know who has the right-of-way and know who’s driving around you. Alertness may be one of your best defenses against an intersection-related accident. Lastly, we urge drivers to curb all of the distractions when passing through these areas. Turn down your radio, hang up the phone and pause the conversations with passengers. These areas need your full and undivided attention. The safety of you and nearby travelers relies on it. 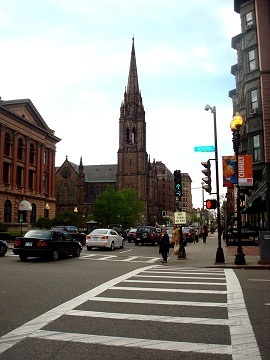 If you or someone who is close to you has been hurt in an intersection-related auto accident in the Greater Boston Area or elsewhere throughout the state, contact Boston Injury Lawyer Jeffrey S. Glassman. Our law firm offers free and confidential appointments to discuss your case. Call 877-617-5333.